Following one of the busiest months in the German yard's history with two launches measuring over 130 metres in length, we take a look at the top 10 biggest Lürssen yachts ever built. 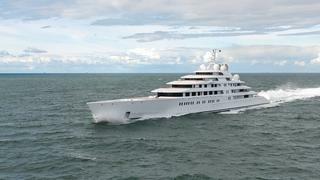 Golden Odyssey is by no means the biggest Lürssen ever, but she still makes it into the top 10. The five-deck yacht was designed by Martin Francis with Alberto Pinto interiors. Golden Odyssey was spotted leaving the German yard in July 2015 and is believed to be owned by Prince Khaled of Saudi Arabia. Following one of the busiest months in the German yard's history with two launches measuring over 130 metres in length, we take a look at the top 10 biggest Lürssen yachts ever built. 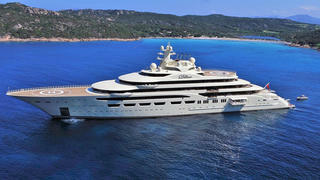 Golden Odyssey is by no means the biggest Lürssen ever, but she still makes it into the top 10. The five-deck yacht was designed by Martin Francis with Alberto Pinto interiors. Golden Odyssey was spotted leaving the German yard in July 2015 and is believed to be owned by Prince Khaled of Saudi Arabia. 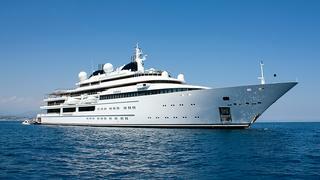 Another big Lürssen yacht on our list designed by Espen Øino is the 124 metre Katara. This very private superyacht is said to belong to a Middle Eastern owner, and she features an interior by the late Alberto Pinto. 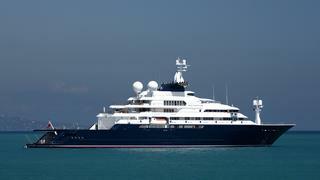 Another big Lürssen yacht with a famous owner is Octopus, owned by Microsoft co-founder Paul Allen. This Lürssen stands out on the list as being the world's largest explorer yacht, and Octopus is used for true scientific expeditions, such as when Paul Allen and his crew discovered a long-lost WWII shipwreck while on board Octopus this year. The newest addition to our list of the largest Lürssen superyachts, Project Thunder emerged from the yard's Bremen facility in April 2017. Due for delivery in spring 2018, she features a striking modern exterior by Espen Øino with jet black topsides and a spectacular triple-height window amidships. Local yachtspotters have also confirmed the existence of a helicopter hangar built into her enormous superyacht mast. At the moment, Lürssen is believed to be working on four further projects over 130 metres, but their exact sizes are unclear at this stage. The newest addition to our list of the largest Lürssen superyachts, Project Thunder emerged from the yard's Bremen facility in April 2017. Due for delivery in spring 2018, she features a striking modern exterior by Espen Øino with jet black topsides and a spectacular triple-height window amidships. Local yachtspotters have also confirmed the existence of a helicopter hangar built into her enormous superyacht mast. 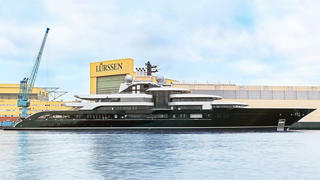 At the moment, Lürssen is believed to be working on four further projects over 130 metres, but their exact sizes are unclear at this stage. The sixth biggest Lürssen yacht to date, Rising Sun has had her fair share of time in the sun thanks to her famous owners. 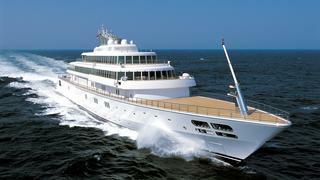 She was built for Oracle CEO Larry Ellison, and now Rising Sun is owned by US record executive David Geffen. The window-full design lets lots of light into Rising Sun’s interior by Laura Seccombe. 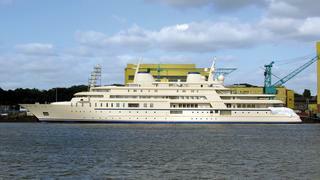 At the time of her launch in 2009, Al Salamah wasn’t just the biggest Lürssen yacht but the largest yacht in the world. She once belonged to Saudi royalty, Prince Sultan bin Abdul Aziz. Compared to the massively voluminous Dilbar, she “only” has a gross tonnage of 7,500GT. 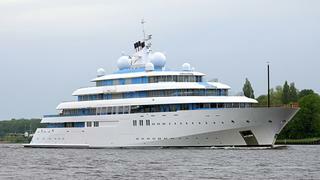 Launched in 2012, the 147 metre Lürssen yacht Topaz is certainly one of the biggest. She is designed by two of the top superyacht designers in the UK, with Tim Heywood penning the exterior — as well as her cool lighting scheme that lights up the night — while Terence Disdale was responsible for interior design. Al Said features an enormous interior, measuring in at a staggering 15,850 gross tonnes. The 155 metre yacht steel and aluminium yacht was launched in 2008 and features exterior design by Espen Øino and interiors by Jonathan Quinn Barnett. If you are counting volume rather than length, Dilbar is actually the biggest Lürssen yacht: her seven decks are stretched along a 156-metre full-displacement hull for a total internal volume of 15,917 gross tonnes. Following her delivery in June 2016, Lürssen also claimed two other records for Dilbar — her 180 cubic metre on-board swimming pool is believed to be the largest on any yacht, while the 30,000kw diesel electric power plant is thought to be the most powerful ever fitted to a superyacht, giving her a cruising speed of 22.5 knots. If you are counting volume rather than length, Dilbar is actually the biggest Lürssen yacht: her seven decks are stretched along a 156-metre full-displacement hull for a total internal volume of 15,917 gross tonnes. Following her delivery in June 2016, Lürssen also claimed two other records for Dilbar — her 180 cubic metre on-board swimming pool is believed to be the largest on any yacht, while the 30,000kw diesel electric power plant is thought to be the most powerful ever fitted to a superyacht, giving her a cruising speed of 22.5 knots. 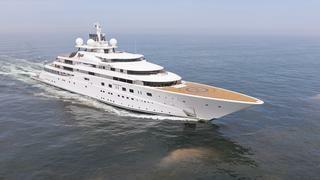 The biggest Lürssen yacht, 180 metre Azzam is also the world’s largest yacht. Designed by Nauta and launched in 2013, Azzam is the flagship the German builder’s fleet. Powered by twin diesel engines and two gas turbines, Azzam blasts off at 30 knots — extremely impressive for a yacht of her size. And, despite shaky claims of a new world’s biggest yacht on the horizon, Azzam will be the largest yacht in the world for the foreseeable future. 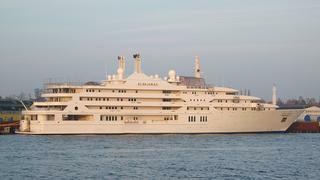 The biggest Lürssen yacht, 180 metre Azzam is also the world’s largest yacht. Designed by Nauta and launched in 2013, Azzam is the flagship the German builder’s fleet. Powered by twin diesel engines and two gas turbines, Azzam blasts off at 30 knots — extremely impressive for a yacht of her size. And, despite shaky claims of a new world’s biggest yacht on the horizon, Azzam will be the largest yacht in the world for the foreseeable future.